Easter week, one of the busiest travel weeks in Spain, was supposed to see three strike days at Iberia Airlines, the country’s flagship carrier. This strike was called by the Confederación Nacional del Trabajo (CNT), a revolutionary anarchosyndicalist union with which the IWW has a long history of mutual support, and Coordinadora Estatal del Sector Handling Aereo (CESHA), a baggage handlers’ union which is not political, but which rejects state funding and professional union staff, and operates through assemblies. The goal of the strike was to continue a series of mobilizations that have been building since Iberia was bought by British Airlines and the new holding company, IAG, announced a plan at the end of 2011 to spin off a new “low-cost” carrier, IB Express. Originally this plan was supposed to preserve existing jobs and create 500 new ones, but as time went on it became clear that this was a way to restructure capital and discard as many workers as possible. Of course, in a country with a 25 percent unemployment rate, the workers did not accept this without a response. Although there has historically been a large divide, with the pilots seeing themselves as separate from the ground staff and flight crew, there was a possibility for united action. The pilots struck at the end of December 2011, and in January 2012 the two majority unions, the Unión General de Trabajadores (UGT) and the Confederación Sindical de Comisiones Obreras (CCOO), worked with the large range of smaller unions that are present in Iberia to call for a strike of all staff—which was then sabotaged when the two majority unions called it off. However this backfired when the CNT branch in Iberia was able to form a coalition with the other minority unions and escalate the fight, beginning with a march of 1,500 workers and supporters (two of whom were IWW members who happened to be in the area) that same month in Madrid. This mobilization has continued, with the minority unions gaining increasing support from the workers as the majority unions revealed just how yellow they were, up through March of this year. At that point, with the threat of united strike action by all of the unions, the government stepped in and imposed mediation. In the midst of large daily mobilizations around the airport, the majority unions signed an “agreement” which includes 3,141 layoffs and fierce cuts against the workers who will remain. The CNT and CESHA declared a strike in response, but they were unable to persuade any of the other minority unions to join them, so they abandoned it for the time-being. 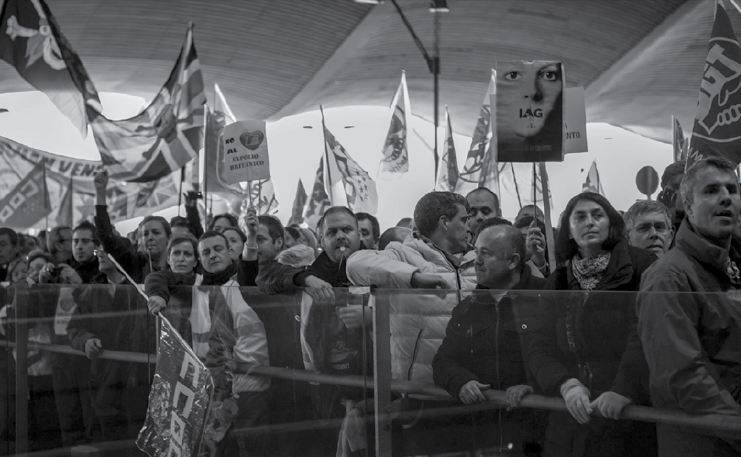 To drive the nail in the coffin, Iberia is prosecuting those two unions for declaring an illegal strike, and has fired the 14 members of CESHA’s strike committee (five of whom have since been reinstated) and seeks to do the same to the CNT. Why is this important for IWW members? The landscape of labor law, union politics and social history in Spain is very different from the Anglo world where the IWW is rooted. Furthermore, Iberia is one very specific company, and there are certain factors that have allowed the CNT to have a more effective presence there than they have elsewhere. However, the CNT at Iberia can serve as a good model for what a small revolutionary union which seeks to grow should be doing. The Spanish dictator Francisco Franco died in 1975; the CNT, having been illegal during his reign, was re-established quickly afterwards and was tightly linked with a quickly growing workers’ movement that worked through assemblies and rejected paid staff and government mediation, as well as political party manipulation. Many of these workers’ struggles took place at the Madrid-Barajas Airport, where a CNT branch was founded the next year. In order to restore social peace, in 1977 the Spanish government worked with the main “Left” parties to create the Moncloa Pacts, the Spanish version of the National Labor Relations Act. This sought to channel all union activity through parliament-style elections, which allow for the existence of many unions. The unions receive money from the government based on how many votes they receive, and paid union time for officers from the company. Although there is no dues check-off and membership is completely voluntary, the result is similar—the unions become structurally separate from the workers and identify with the interests of those who sign their checks. The CNT was the only major union at the time to reject this agreement, although a minority left to become what is now the Confederación General del Trabajo (CGT). Following this there were several decades of government repression, relative social peace and media and political party manipulation, amongst other things. Finally around the turn of the millennium the CNT began to have more of an echo among workers who wanted to organize without subsidies or staffers. Relative to the IWW, the CNT is very large—about five or six times our membership in a country with a population comparable to California’s. Nonetheless, it is still very much a minority union, one of many. The section at Iberia, which is relatively strong and active in many parts of the company, is somewhat exceptional, and the comrades there give part of the credit to the elitist pilots’ union, which boycotts the elections and negotiates directly with the company, although probably for different reasons than the CNT. So what do you do when the country’s economy collapses and the main political parties and their unions are negotiating with the European Union (EU) about how best to sell off all of the public services and rapidly nullifying practically the entire code of labor law? This is a discussion that is happening within the CNT and elsewhere, including within our organization, and it’s an important one. What the CNT has been doing at Iberia for 35 years seems to be a good model, a balance between two extremes that are often proposed: a closed “revolutionary political organization” or a semi-radical “mass movement.” A revolutionary union does not need to encompass the entire working class, but it also should not confine itself to workers who are already radical. It can act as a fighting organization on the shop floor (what “union” used to mean) and at the same time maintain a higher vision of a struggle against capitalism. This is not merely theoretical—it will have profound impacts on how an organization goes forward. Even if a revolutionary union preserves its specific identity, which it should do, it can also act as a catalyst among other workers’ groups, working-class organizations, and the broader working class in general. None of us know the best way to do this yet, but the CNT section at Iberia is showing one route to get there. As global capitalism tries to throw Spain in the same trash pile as Greece, the CNT might be able to act as a catalyst turning things in the other direction.